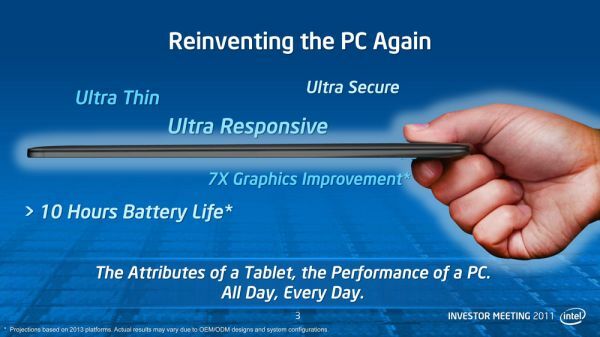 It looks like the latter two, at least, will be addressed by Intel's new "ultrabook" platform. Really naff name, but they are promising >10 hours battery life (not unreasonable most netbooks now accomplish about 8 hours and the Asus X101 claims >14 hours) and weeks of standby. The "Rapid Start"/suspend to NAND function means Windows can wake from asleep in under 2s. As for the form factor, it remains to be seen what the OEMs come up with. Current models are ultra thin. Neat, but we already had this. In the 90's. They were called handheld personal computers.